On our way to the Austin airport, I had so much pressing head and heart, a virtual hangover from the bacchanalia of worship, wisdom, vision, inspiration and information imbibed at the Verge 2012 conference. How to live on mission. Being incarnational. Reaching to fulfill Christ’s Great Commission. Loving and living as He loved and lived. Being the church in seminal, organic, invasive ways. “Fill this plate with what He will supply. Being a writer, it’s hard for me not to resort to such metaphors and similes. Analogies aside, there was a ribbon of warning and exhortation coursing through the flow of the Verge conference: You can’t do this; don’t even try. We were continually dragged back to the words of Jesus in Acts 1: 4-8 and John 15: 5. Wait for what the Father promised. You will be baptized with the Holy Spirit. You will receive power when the Holy Spirit comes upon you. THEN you shall be my witnesses. Apart from Me, you can do nothing. The conference had been both empowering and sobering; now we were on our way back to our “Jerusalem,” anxious to apply the riches we gleaned. Tired, but full, we had no idea that our Father had scheduled a missional “pop quiz” to help kick off the gestation that which had been conceived at Verge 2012. At the airport, with the rental car put to bed, we did our check-in routine and went to the gate area. Our seat assignments were near the back of the plane, so I asked the rather grumpy gate agent if we might be reassigned more to the front. With some irritation, she took our boarding passes and said she’d check on it and let us know. So I went back and sat down, feeling like I had been missionally nice enough, in spite of the fact that I really wanted to give her a stern lecture on customer service. Before we boarded, I rechecked with her and she had reassigned us to the bulkhead seats at the front of the cabin. Hallelujah! God is good…all the time! I expressed incarnational gratitude to her, and then noticed we had a middle and window seat, which gave me pause, since I prefer aisle seats. Oh, well, bulkhead seats are very roomy…no problem, I thought, and resumed my cheerfulness. And maybe the aisle seat won’t be occupied anyway. With that additional thought I brightened even more. Upon boarding, however, I discovered that the aisle seat was very much—amply, one might say—occupied. By a formidable woman road warrior who, in a former life, would have likely been welcomed to Attila’s Hun division. And, she emanated resentfulness and irritation. With eyes glaring holes into her newspaper, her demeanor dared anyone to create a disturbance in her little patch of aircraft cabin. That’s a tall order in today’s coach class, where even a hobbit would be unavoidably invasive. As my petite wife, Shelley, tried to squeeze past her to the window seat, she sat as unyielding as a granite statue, stiffening noticeably (and intentionally) as Shelley, despite her best efforts, made contact with her in passage. Her emanations flared appreciably. If body-language can swell, our seatmate’s did. And the flaring emanations caused slight radiation burns on the side of my body facing her. (Just kidding about that part.) Baggage stowed, I gingerly maneuvered my way past her and dropped into my seat. At a slight, right-leaning angle. You see, she had her arm lapped almost two inches past the armrest into my seat area. I waited, thinking she would realize and move back a little. So, leaning like Pisa’s tower, I waited and pondered what to do. Should I make a little joke about how my sister and I drew a line down the center of the back seat on car trips and vigorously guarded our territory, punishing incursions swiftly and with impunity? She somehow didn’t impress me as the joking type. So, as subtly as I could, I pressed my arm into hers on the armrest to send a little signal. She swelled, emanated, turning slightly and deliberately to stare down at my offending arm without moving her own. All missional motivations vaporized immediately, but I did become very intentional…in a non-Verge kind of way. “Do you think we could negotiate a little space where I can put my arm? Your arm is over on my side.” I think my words were somewhat louder than I had intended because people still filing down the aisle to their seats stared at us. Two things happened simultaneously: to my right, my wife crumpled like a punctured beach ball, while my companion on the left, having achieved the dimensions of Tolkien’s Balrog, fixed her flaming gaze on me for a moment and then spoke. “Certainly sir,” she snarled in frosty, clipped, and distinctly New York tones. “Please help yourself. Take all the room you need.” Drawing her arm way back in exaggerated deference, she waited while I withered, fixed in her hostile glare. Pierced to the heart, I breathed an urgent prayer: Kill me, Lord. Please kill me right now! My wife, I’m sure, was in complete agreement with that request, and suddenly became very interested in watching the baggage handlers through the aircraft window. Eventually, she turned away from me and resumed the visual incineration of her New York Times. Every turn of the pages rattled with loud indignation. Since God hadn’t seen fit to snuff me out of my misery, I pulled out my Randy Alcorn novel, Safely Home, about the persecuted church in China, and tried to read. My heart was too grieved and convicted to concentrate. Have you ever blown it, then, by doing what you know God wants you to do, there’s an expectation that He will immediately fix the situation: everyone kisses and makes up? And the Gospel is shared to the praise of the glory of His grace? Well, that’s a different story. In this story, re-enter Balrog, stage left. Re-assuming the exaggerated, arm-retracted pose of indignance, she spoke again without the slightest hint of conciliatory tendencies or warm fuzzies. You know, I honestly got the feeling that my happiness wasn’t really the pith of what she was trying to communicate. In any case, my very pragmatic plan for quick repairs had obviously fallen flat. I don’t think she was exercised in the rules of engagement that I wanted her to follow. After a couple more moments of the silent, frosty gaze, she retreated back into her newspaper. Noisily. By now Shelley was deeply engrossed in her own book (and both of us were longing for the back of the plane). And so it went. 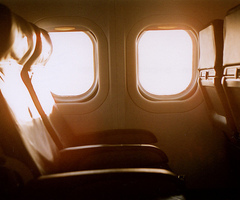 The flight took off, and it was undoubtedly the longest flight of my life, emotionally-speaking. I had lots of opportunity to repent, to think over the high callings we had learned about at Verge, and about the lack of personal adequacy to be what we’re asked to be or to do what we’re asked to do. I had just been God’s visual aid in teaching that principle. I also had a lot of time to pray for my seatmate, begging God for another chance to speak with her, wondering what past hurts might have contributed to her cast-iron, angry shell which I had foolishly hammered on. I was miserable. Seeing what you are apart from Christ is a bit like the horror of Dorian Grey’s portrait. God, in His mercy, reminds us from time to time. It’s not very pretty, but it is very humbling. I was especially grieved because I saw her glance over at the book I was trying to read a couple of times, which was obviously Christian. Plus, as I (mercifully) only realized later, I was wearing a T-shirt from the Christian university my daughter had attended. So, in her mind, I was most likely put in a corral with other bumper-stickered, t-shirted, judgmental, insensitive fundamentalists, and the hateful funeral demonstrators from Westboro Baptist Church. Finally, the long flight landed and taxied in to the gate. I wondered if some type of opportunity might afford itself. I watched for any nanosecond of eye contact that I might seize upon. She deftly avoided that. She stood, opened the overhead bin and threw her carry-on bags into her empty seat. Then she withdrew her jacket and in putting it on, slapped my face with her sleeve. Whether intentional or not, in my newfound humility, I was O.K. with that. When the aircraft door was opened she was one of the first off the plane, and I figured any opportunity for further contact was gone. I then noticed her crumpled boarding pass on her seat, which had her name on it. I cautiously picked it up and slipped it into my novel. At least I could pray for her by name. Partially relieved, but mostly sad, I walked up the jetway with Shelley and into the terminal gate area. To my shock, there, not ten feet away was my “friend.” She was just standing there. Not talking to anyone, not on her phone, not arranging her luggage…just standing there. The way she had bolted the plane, I assumed she was long gone. But there she was. God had heard my prayer. As I emerged from the jetway, she made eye contact and watched me without expression as I headed in her direction. I probably looked like the next in line at the guillotine, but I managed to take a breath and try one more time. Her non-expression turned to curiosity, then to mild amusement, and then she managed a little laugh. She shook her head, and made a sign of dismissal with her hand. “It’s O.K. Don’t worry about it.” Her look told me that she still didn’t quite “get” this guy’s obsessive need to make it right, but something definitely broke. And I was so thankful for God’s resurrection of a missional moment—not the kind they teach you at Verge conference, but then, God isn’t always conventional. I didn’t get to share the gospel with her, but I believe that the Holy Spirit may’ve cracked the door a bit. And I’m praying for her by name. There are laborers that I see in my spirit who I believe will be mobilized for harvest. God cared enough to stop her in her retreat—allowing the tiniest seed to be planted; He must surely care enough to water it. Missional moments may be messy at times, but the Lord of the harvest owns them all. And we—in spite of who we are sometimes—are being led in His triumph in Christ Jesus (2 Cor. 2:14). Referring to The Picture of Dorian Grey, Oscar Wilde’s classic work about the corruption and narcissism of mankind. Glad you enjoyed my humiliation! 🙂 Thanks.